I LOVE Pancakes, I could eat them for breakfast, lunch and dinner. When you first think of pancakes you think sugar, carbs and more sugar. However, NutriPaige Protein Pancakes are totally clean and provide you with the essential nutrients to kick-start your day. You will wonder how something SO tasty will be so good for you. They are so delicious and fill me right up and have been my ‘go-to’ breakfast for year. You may need to allow yourself a little extra time to make them in the morning but as breakfast is so important, I always give myself enough time to make a good meal and sit and have my morning coffee before the day begins. If you’re a 'I eat breakfast at my desk' kind of person, why not make them the night before and take them to work in a ziplock bag? 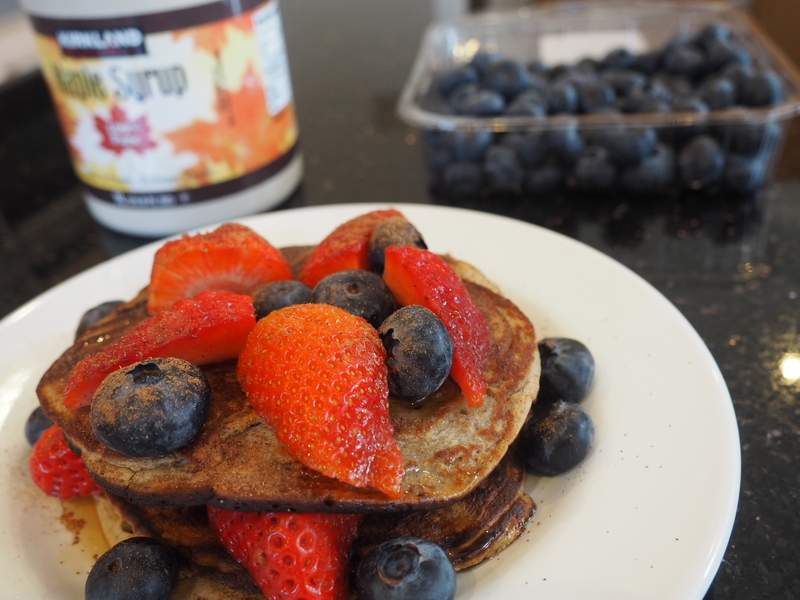 If not, save this recipe for a treat at the weekend and treat your friends to super healthy pancakes. I think my friends love staying at mine because they know I will cook them a breakfast fit for a (healthy) princess. 1. Place all ingredients into a blender/smoothie maker but If you are not, mash the banana in a bowl with a folk until a lumpy-liquidy consistency. 2. In a separate bowl, combine the rest of the ingredients and then pour in the banana. 4. Heat a medium-sized pan with spray oil or a TSP of coconut oil and allow to melt on medium heat. 4. Pour mixture onto the pan, making sure it is evenly spread. You can also do smaller pancakes to stack ‘em up! 5. Once mixture begins to bubble, use a spatula to flip it over. 6. Cook on other side for a couple more minutes. Serving Suggestions: Top pancakes with 1-2 cups of fruit. My favourite is a berry combination of blueberries, raspberries and strawberries to get my morning dose of antioxidants. If you would like to add a little sweetness, pour a little maple syrup over the top and sprinkle a little more cinnamon. Health Tip: A great way of adding in extra greens, put spinach into your pancake mix, you cannot taste it one bit!! It may take you a while to get the hang of this recipe but once you do, you will be super quick and making them and I guarantee it will become one of your staples.